Since 2012, Australia’s biggest schools initiative, Music: Count Us In, has been strengthened by collaboration with the Why Music Matters campaign – a collective of music industry professionals dedicated to reminding listeners of the value and significance of music. 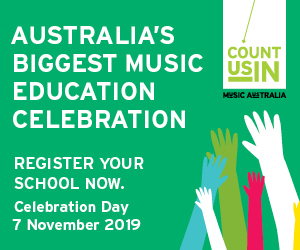 In collaboration with Music Australia’s Music: Count Us In, Why Music Matters has worked to enrich students’ participation in the program and assisted teachers in imparting the joy of music in their classrooms. In collaboration with Why Music Matters, and working with many education partners across the country, Music: Count Us In has done much to raise the profile of music and music education in Australia. Why Music Matters continues to set the standard in the realm of educating on and working towards improved rights for Australian creatives. As Music: Count Us In’s annual program song is written by and for students, it provides an excellent opportunity to explore matters related to music, music ownership and the joy of music making. 2017 marks the 6th year of a collaboration between Why Music Matters and Music: Count Us. This year’s Music: Count Us In Program Song is ‘Shine Together’ and the entirely original animation was created by Tristan Klein (Sydney). The annual animation from the Why Music Matters campaign allows students to more completely engage with the joy and power of music in their lives. It encourages them to explore the themes of the Program Song and to actively participate in creative endeavours and collaborative music-making. Why Music Matters’ animation of ‘Shine Together’ will also be released with an accompanying lesson plan, available to all participating schools from for the start of Term 4. It will focus on exploring the animator’s creative process and help to assist students in comprehending the themes, symbols and devices of the animation used to reflect the themes and content of ‘Shine Together’. It will inspire discussion around matters of creators’ rights and help students understand various issues around copyright. PrevGo Betweens Documentary Screens In Cinemas Next Celebrating Music: Count Us In 2017 – LIVE from Melbourne!